They sacrifice their lives to keep us safe and to protect the values that Canadians hold dear. The Canadian men and women who serve in the military, Veterans, and their families, face many diverse experiences overseas, and upon their return to Canada, which puts them at greater risk for physical, social and mental health issues. Conditions such as post-traumatic stress disorder (PTSD), chronic pain, and moral injury are among some of the common issues faced by those who serve and protect. The Canadian Institute for Military and Veteran Health Research (CIMVHR) is an organization dedicated to enhancing the lives of Canadian military personnel, Veterans and their families by harnessing the national capacity for research. The organization, which was established in 2010, aims to drive support for close to 70,000 members in regular force CAF; 27,000 in reserve force; 54,000 military family members and over 600,000 Veterans. CIMVHR, in partnership with IBM Canada Ltd. and Babcock Canada Inc. recently launched a new research initiative called the Advanced Analytics Initiative, a $12M partnership that will fund cutting-edge research using big data analytics, machine learning and other data science approaches to health solutions for Canadian military personnel, Veterans and their families. The Initiative supports the Government of Canada’s Industrial and Technological Benefit (ITB) Policy. “IBM Canada has a long and proven history of supporting Veterans through initiatives like our Veteran’s Employment reskilling. By working with CIMVHR and Babcock, we are able to advance this support in new and important ways using modern AI and analytics technologies and related expertise,” said Regan Watts, Head of Innovation, Citizenship and Government Affairs, IBM Canada. To date, six projects have been funded under the initiative, four of which are accessing SOSCIP’s advanced computing platforms and project support network. The R&D projects will analyze large data sets and leverage technologies such as machine learning and natural language processing to better understand, diagnose and treat serious physical and mental health conditions, such as post-concussive syndrome (PCS), post-traumatic stress disorder (PTSD), various brain injuries and chronic pain conditions. All of the projects under the initiative are boosted with cash and in-kind funding support from Mitacs and IBM Canada. “This initiative is important to all Canadians because we have a responsibility to care for the people that we send overseas,” said Dr. Bélanger. “They fight for our freedom and values. A partnership with IBM Canada and Babcock Canada gives us the capacity to further research that will improve and enhance medical treatment, and to provide valuable tools to personnel and their families when they return from service. The initiative came as a result of CIMVHR’s annual Forum, an event that brings together hundreds of thought leaders from government, academia, industry and philanthropic sectors to present new research, exchange ideas, share insight, learn and collaborate. IBM Canada identified access to technology as a significant gap in facilitating cutting-edge research and a partnership was formed. Forum 2018, which will be co-hosted by CIMVHR and the University of Regina, will take place October 15-17 in Regina. More information about Forum can be found here. The projects that have been awarded to date mark a new era of using sophisticated high-performance tools to address health research. A research team from Western University and the University of Alberta, along with the Lawson Health Research Institute and the Homewood Research Institute, will utilize functional magnetic resonance imaging (fMRI) data to determine if neurobiological machine learning algorithms can predict psychiatric symptomatology, such as PTSD, and treatment outcomes in military members, Veterans, their families and civilians. Researchers at Queen’s University are collaborating with SOSCIP and IBM to develop an instant messaging smartphone application to connect military family members to a mental health solution. The team will access IBM’s Watson Cognitive platform using an advanced AI Chat Bot conversation system that will be able to carry on an intelligent conversation with military personnel and/or Veterans and identify potential circumstances where they may need more support and encourage them to access available programs. 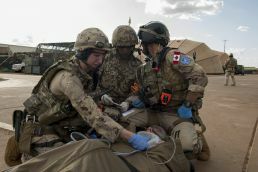 A Carleton University research team will use machine learning to investigate the clinical management of military members and Veterans suffering from a complex medical triad of traumatic brain injury, chronic pain, and post-traumatic stress disorder. The team will use a Computer Assisted Rehabilitation Environment (CAREN system) which will collect and consolidate a series of non-invasive whole-body biological measurements from patients during immersive therapy session. Machine learning will be used to develop and deploy real-time estimators of sympathetic neural activation of the autonomic nervous system, enabling clinicians to create individual treatment plans for patients. Click here for a full list of research projects. that have been awarded through the Advanced Analytics Initiative. Les forces néerlandaises, allemandes et canadiennes s’exercent à effectuer des évacuations aéromédicales au Camp Castor, à Gao, au Mali, au cours de l’opération PRESENCE – Mali, le 1er septembre 2018.